In da Regl wead ban Marathon af da Strass grennt. Entstandn is a ois Eainnarung an an Laff vo an Soidotn im antikn Griachaland, dea wo de Botschoft vom Sieg in da Schlocht vo Marathon af Athen brocht hod. 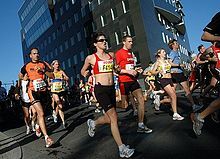 ↑ "IAAF Competition Rules for Road Races". . International Association of Athletics Federations. 2009. Archived from the original on 2015-09-23. https://web.archive.org/web/20150923182842/http://www.bcathletics.org/main/rr_iaaf.htm. Retrieved on 1 November 2010. De Seitn is zletzt am 31. Oktoba 2018 um 02:05 gändert worn.